Read here to learn all about creating and the usage of Zunos Libraries. Libraries is a staging area for unpublished media and also facilitates in sharing linked content items throughout a profile or multiple profiles. Clicking on the Libraries button will display the libraries available to you. Click on the respective library name to display the content available to this library. Click on the Libraries folder button within the Drive navigation pane, click Add Content and select Library. You can now either upload new content or move existing media/folders from your Live Content. 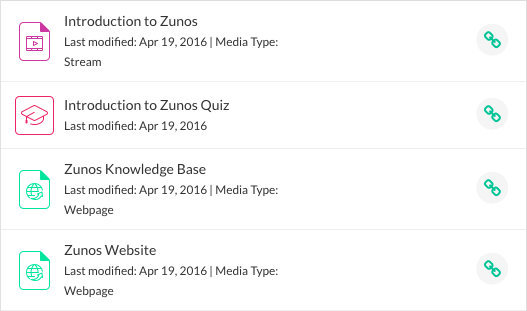 You can add media, forms, message templates, quizzes and achievement groups to a library. Simply drag and drop the media/folders you wish to share from the Libraries to the Live Content area. This creates a linkage represented by the green chain next to the respective media/folder icon. Once a linked file is created, all linked files in the account function as independent linked files. Any linked file can have its settings changed and be renamed by Admins. Re- uploading a file in the library will update all of the linked items. Once a library file is dragged to Live Content a green chain icon is made present to show that the file has been made active. 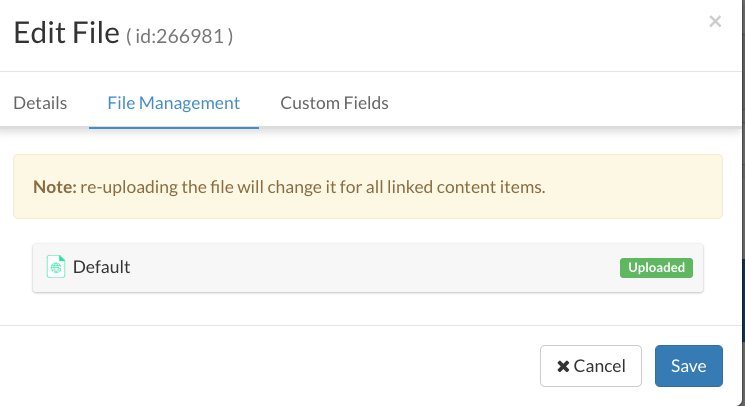 In order to update a linked file, simply click on the media file name or the Edit pencil icon in the Content Details' section to open the edit menu. Once the edit menu opens, click in the File Management tab. Use this section to re-upload your file. Once you have chosen your file click Save this will update all the linked files associated to this media item.